It's generally a good idea to think about fertilizing asparagus in the hot summer months of July or August. If you planted asparagus earlier in the year, the shoots are elongated and becoming woody. The ferns may have even begun to emerge from the shoots. If you have a well-established asparagus patch, the ferns are probably growing like crazy. Now is the time for fertilizing asparagus. Choose a good fertilizer with higher phosphate and potassium levels. A 5-10-10 or 8-24-24 fertilizer formula will work well. Pay attention to the 3 number code on the bag of fertilizer. These three numbers indicate the amount of nitrogen, phosphate and potassium that are contained in that particular fertilizer, respectively. For instance, a 10-10-10 fertilizer contains 10% nitrogen, 10% phosphate and 10% potassium. A 5-10-10 bag would contain 5% nitrogen, 10% phosphate and 10% potassium. Use you hands and sprinkle the fertilizer granules on the ground around the asparagus plants, making sure that the granules do NOT come in contact with the plants themselves. This may burn the plants or have other negative consequences. Follow the manufacturer's directions for the amount of fertilizer to apply. Most are applied at a rate of 1 1/2 pounds per 100 square feet. After applying the fertilizer, water it in well. This will allow the nutrients to enter the soil and be absorbed by the root system. 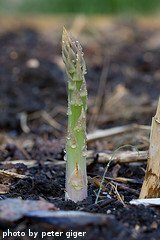 After your patch is well established, it's also a good idea to think about fertilizing asparagus in the early spring. Again, use a phosphate and potassium rich fertilizer. This will give your plants the boost they need to produce lots of high quality spears that can be harvested later. Asparagus plants are generally fairly drought resistant by nature because they have deep root systems. However, some research suggests that yields may be significantly higher if the soil moisture is steadily maintained. Use your hand or a small trowel to dig down 6-8 inches into the soil. If the dirt appears to be dry, a long soak is probably a good idea. 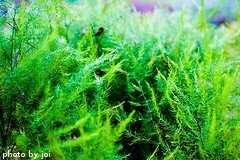 When watering asparagus, concentrate your efforts at the base of the plants. If you avoid watering the tops of the plants, they will be less likely to develop fungus-related diseases. It's also a good idea to water in the early morning hours. This will allow the afternoon sun to evaporate any moisture that may be clinging to the tops of the plants. In drought conditions, you should water the asparagus plants thoroughly every 10-14 days. In late fall, the ferns will turn completely brown. Do not be alarmed - this is normal. Like many perennial plants, the foliage dies off in the fall to allow newer and stronger growth to appear the following spring. After the first freeze and after the ferns have turned brown, it's a good idea to mow or cut down the entire asparagus patch. This will remove all the dead foliage and stalks and make room for the re-birth of the plants in the spring. The removed foliage can be added to your compost pile or discarded.